Best Blogger Template Style - The Work A Holic Template is a specialist style for Photographers, Designers or just blogs that display lots of images.The home page displays the main image from the nine latest posts which can be clicked to lead to the full post or more images.When the home page images are hovered over they also display a message.The template also has a sub header and a three column footer section.The design is clean and white. 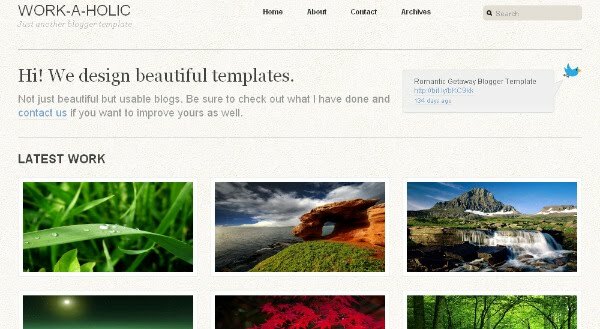 Hi - I have uploaded this template but only one image shows up on the home page instead of 9 - like in the demo. can you please tell me how to fix this? thanks! Andrea, you must have your settings to only diaply one post on the home page.Go to your setting, under 'Posts and Comments' the first option lets you choose how many posts to show.